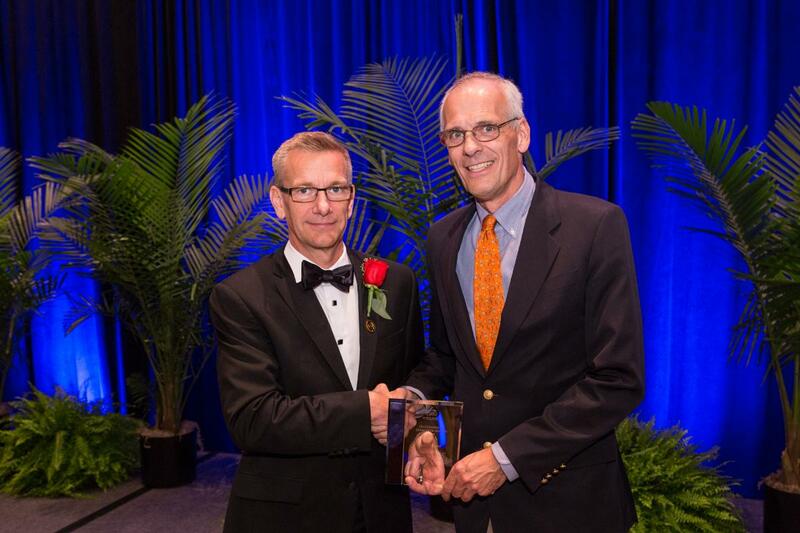 Interim Department Head for the Department of Geophysics Roel Snieder has been named 2016 Outstanding Educator by the Society of Exploration Geophysicists. outstanding contributions in teaching of geophysics classes at any educational level; impact on education programs by commitment to excellence in geophysics education; special dedication to advising, supervising and mentoring students; providing extraordinary inspiration to the next generation of geophysics professionals. Snieder was presented with the award on Oct. 18 during the 2016 SEG Annual Meeting in Dallas, TX. SEG President John Bradford presents Roel Snieder with the Outstanding Educator Award at the 2016 annual meeting. Snieder is the W. M. Keck Distinguished Professor of Basic Exploration Science at Colorado School of Mines. Snieder has been committed over the past decade to using his talents to educate students and the public. He lectures to not only students in universities but also to representatives of local companies, international industry, public clubs, societies, schools, and other public forums on issues concerning the art of science, future energy portfolios, and how the public can interact and engage to solve some of the world’s most pressing problems. Read more about Snieder here. The SEG is the international society of applied geophysics and a not-for-profit organization which aims to promote the science of geophysics as well as the education of applied geophysicists.